Well after nearly a year’s sabbatical since my last update to this dungeon I’m back with another level of Hightop Dungeon. The Fungal Cavern is a naturally occurring cavern which, as its name implies, has become colonized by a large species of fungi which fruits underground. The culinary merits of these mushrooms are modest, as the flesh of their fruit is tough and fibrous. Nevertheless the fungi provide food to a host of subterranean creatures, including many of the bizarre aberrations ascending from Hightop’s unknown depths. 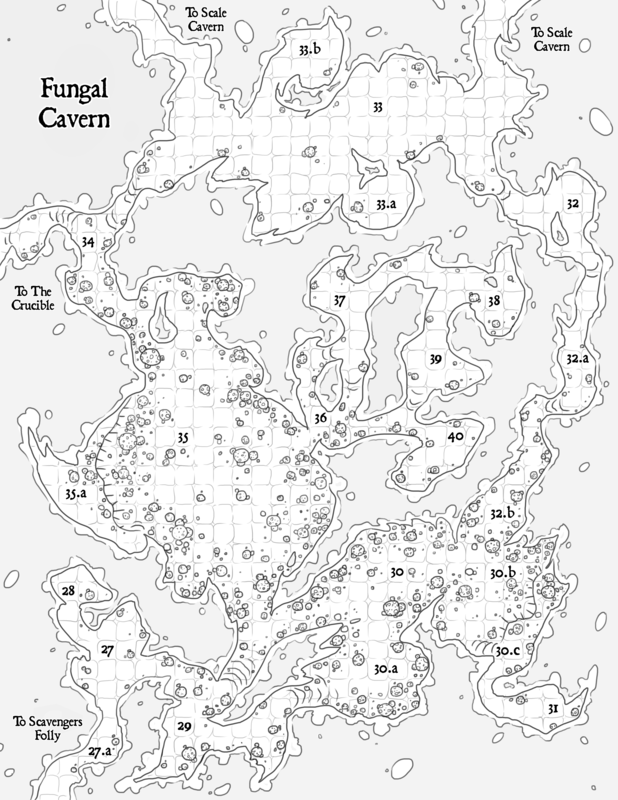 Kobolds, Troglodytes and Grimlocks (originating from Scale Cavern and Fang Grotto) all claim the Fungal Caverns as their tribal hunting grounds. Violent clashes between these rival parties are not uncommon. Violet Fungi also inhabit the caverns. They use the native fungi as cover in order to lure unsuspecting prey into their tentacles. The Fungal Cavern is naturally connected with its neighbor to the north, Scale Cavern. Thanks to large tunneling vermin the Cavern is also now connected with Scavengers Folly to the South as well as to The Crucible directly beneath it. A few early adventurers claimed to have discovered a second extremely rare and expensive variety of mushroom here highly prized for its medicinal and psychedelic properties. While most consider this a baseless urban legend invariably a handful of plucky adventuring parties make the trek to the Fungal Caverns in hopes of uncovering a specimen of this precious fungi.